A Tryst with Endurance – Grab a cuppa, tell a story or listen to one. If you define adventure by adrenaline rush, then I would definitely not qualify as adventurous. I mean, one look at Kingda Ka at Six Flags and I knew that it was a clear “No” for me. Heck, I didn’t even dare to go near Drop of Doom! But I do have plenty of curiosity that always drives me to explore/ experience/ try out new things that push the boundaries of my perspective and cognizance. And that was exactly what led me to this. Once in a while life gives us a chance to be a part of something extraordinary. That day was to be another mundane day in office but next to the elevator I saw this poster, a green poster, announcing Oxfam’s Inaugural Trailwalker in India and six words caught my attention, “100 kms | 48 hours | 4 people”. Instantly, I knew that I had to do this. But where would I find three other just as insane people willing to trek 100 kms through rural India in 48 hours? Hence began the search for a team. When all my friends dismissed the idea as sheer madness, I turned to FB. Never the one to disappoint, FB found me my first insane team mate, Balaji. I had known Bala since college as he was in the batch junior to mine. Bala never ran out of enthusiasm even in the most hopeless of situations. The Marketing Man of our team, Bala put up our wonderful team pages on Oxfam’s website and FB and spearheaded our fundraising for Oxfam’s charitable work in India. We found our third team mate, Ajay, through the organizers and a little bit of help from a dear friend. A marathon runner, Ajay was probably the only one of us who exactly knew what we were getting into. Like a silent assassin, Ajay went on conquering kilometer after kilometer with the whole team’s emergency supplies on his back and without shedding a single bead of sweat. Our search for our fourth team mate, led us to Jyothi. Although we were living in the same apartment complex at that point of time, it was not until I dropped a mail to the colony’s mailing list asking for people interested in participating in this walkathon that I got to know Jyothi. 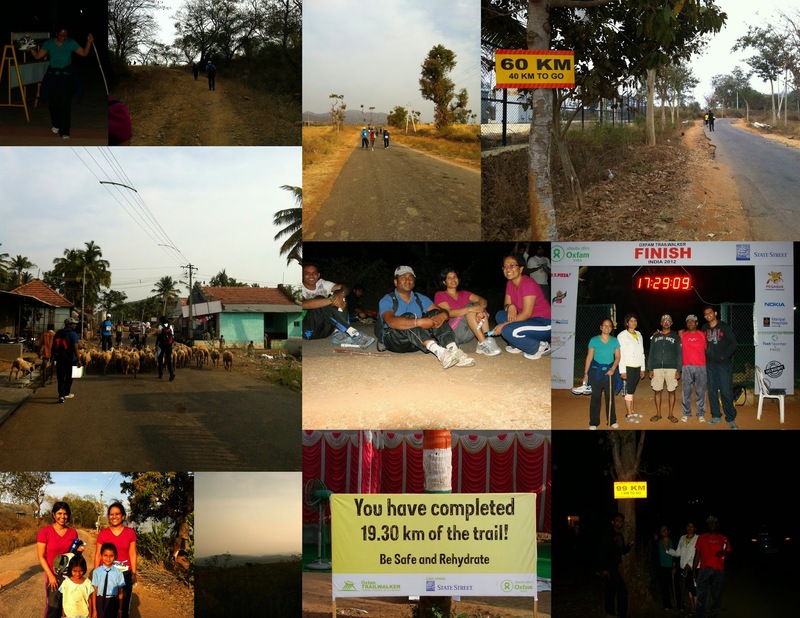 Be it chasing away eve-teasers single handedly or walking 100kms without a blink of an eye in spite of a painful blisters and a sprained knee, Jyothi is one courageous lady. Hence was born, Team Forrest Gump. But our team would be incomplete if I did not mention one more person, our crucial one man support team, Ajay’s brother Lucky who sacrificed his weekend, sleep and rest to be our lifeline as we trekked for over two days from Kaveri Sangama in Mekedatu to Eagleton Resort in Bidadi. From getting us food and water, to finding us places to rest along the trail, to ferrying all our essential stuff around, I think I can safely say that we would have found it really difficult to walk the whole way if it were not for Lucky. I always believed that no matter how much we practice, when the actual time comes, walking a 100 kms will ultimately be a test of endurance and determination, but I think I grossly underestimated the degree. I lost count of the number of times I just wanted to give up and stop, but pushed myself just a little more thinking just a little further before I stop. It was difficult to give up when I saw my team mates too battling pain, fatigue and poor organization to tirelessly trudge towards that golden three- digit number. For 46 and a half hours, the road was our only home as we trekked through lush fields and dense forests, climbed steep hills and crossed almost dry streams and walked through breathtaking sunrises and beautiful sunsets. As we passed through busy towns and sleepy villages farming silk, ragi and sugarcane, we encountered bunch of eager kids waving at us cheerfully; some even came and offered us flowers; curious villagers who stopped their daily chores to come and ask us a multitude of questions from, ‘Where are you coming from?’, ‘Where are you going?’, ‘Why are all of you walking this way?’ to ‘Have you had food?’. Such warmth and such kindness for complete strangers, in spite of their own very obvious paucity. They would often beg those of us who knew Kannada to stop and chat with them but we had miles to go before we could chat. As night fell, the teams would walk together in clusters guided only by the light of our torches and moonlight since we were passing through elephant country. Night time was the ideal time to cover maximum distance since the harsh sun of Southern India was far-far away on the other side of the world. Sleep was an alien concept as we only stopped to rest for a couple of hours on the front porches of schools or houses of villagers and on the terrace of houses under construction. At every check point, the necessary fluids and fuel was consumed, aching muscles and joints were stretched, blisters and sprained knees and ankles were re-bandaged before we continued towards our goal. The “Fast and Fit” never left the Slow behind to rush to the finish on their own and the “Slow and Unfit” always strived to speed up and keep going so as that the Fast didn’t have to compromise too much on their speed. At long last when we reached Eagleton Resorts, the end point of the trail walk after trekking a 100 kms early in the morning of the third day, it was almost an unbelievable feeling to set sight on that yellow milestone sign that we had been counting down all the way saying “100KM, 0KM TO GO”. It was overwhelming to say the least and the fact that we were the last team to make it to the finish line was a cause of zero remorse to us. We were just glad to have made it there together. Looking back, Trailwalker didn’t just bring me face to face with my own physical and mental endurance; it also taught me a great deal about putting one’s team and the commitment ahead of personal gains, shortcomings and disappointments. Cheers to Team Forrest Gump!!! 'Adventures are not for me'….this idea is somehow changed after reading this. Nice narration!